AFTER MORE THAN a decade as a judge on the hugely popular show, Louis Walsh has announced he’s not planning to return for another season on the X Factor. 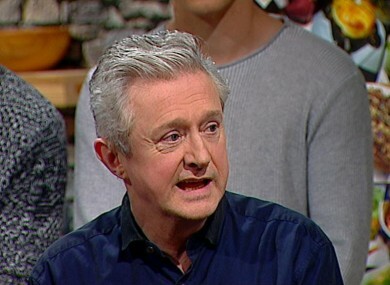 The Irish boyband manager – whose latest project is a band called Hometown – told the Seven O’Clock Show on TV3 that he’s “done” with the show. That was last year. I’ve done 11 seasons. That’s a long time on television. I think they’re going to change it, go for a few new faces. I think I’m done with X Factor honestly. My day job is as a manager, I’ve kind of neglected that. I want to get back to being a manager- I’m working with Shane Filan, he’s got a new record coming out and I’m working with Hometown. The pop mogul also said he “never wanted to be on TV, it just happened”. Walsh also spoke about One Direction, saying that while Simon Cowell “takes most of the credit”, “Nicole Scherzinger and I were very much involved as well”. Email “Louis Walsh says he's 'done with the X Factor'”. Feedback on “Louis Walsh says he's 'done with the X Factor'”.